Blueberry burgers? You must think I’m crazy. And you might be right. However, to borrow a phrase from Katie who blogs at This Chick Cooks and introduced me to this fabulous recipe, these burgers might sound so wrong, but they taste so right. Ben and I made these burgers last week for our Memorial Day dinner and let me tell you–they do not disappoint! Unfortunately, we don’t have a grill at our apartment so we had to cook them indoors on the George Foreman, but they still were a tasty introduction to summer eats… and a great recipe for this month’s Secret Recipe Club post! I love SRC days because they encourage me to broaden my culinary horizons while introducing me to a new blogger. If you’re new, you might be a bit confused. SRC? What’s that? Let me explain. It’s a pretty amazing blogging club. Basically, the premise is this: you’re assigned a different member’s blog every month. You visit their blog, choose any recipe you want, then make it and share it on your blog… all while keeping your assignment a secret! Everyone else posts about their secret blog the same day. It’s fabulously fun to try out new blogs. If you have a blog, definitely check it out and consider joining! I highly recommend it. Katie writes This Chick Cooks with a focus on eating and cooking real, whole foods. 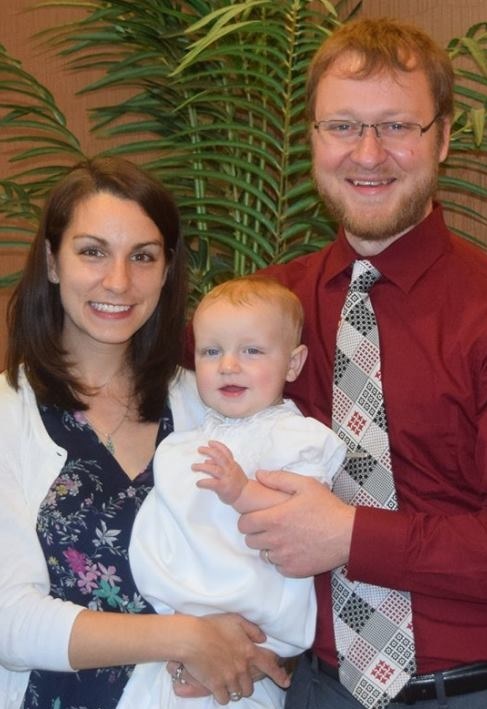 It is her mission to feed her family well, and she has plenty of recipes to accomplish that. She has tons of wholesome, tasty recipes–including many for muffins and coconutty treats… two of my loves! 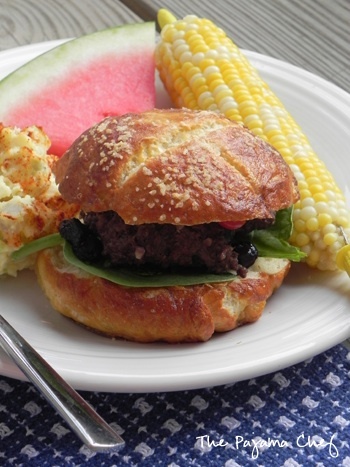 🙂 Aside from making these unique burgers, in the future I’m definitely going to try Coconut Cream Larabars, Cornmeal Apple Cheese Muffins, and Creamy Corn and Chicken Summer Soup. They all sound so amazing, but for now, let’s talk about these burgers! 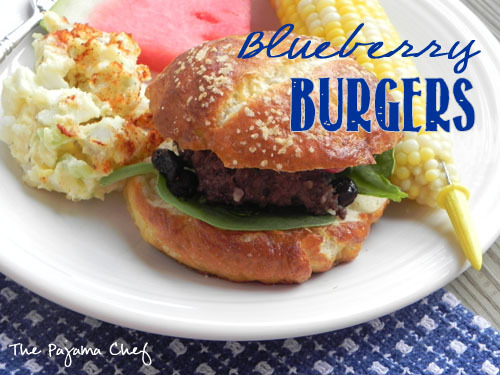 Blueberry Burgers are so fresh and tasty. I totally get the sentiment that fruit in burgers is just weird, but hear me out. 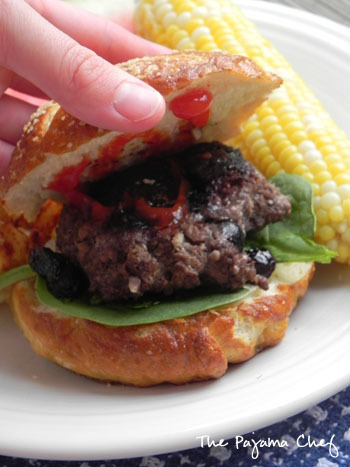 The sweet, ripe burst of blueberries throughout is a sophisticated [Ahem… Can burgers be sophisticated? I vote yes.] foil for the salty, vinegary tang from the balsamic and Worcestershire sauce. Add in the bite of minced garlic and this meat really shines. 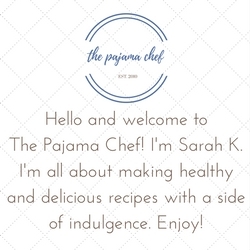 Now, before the recipe, I do want to make one shameless plug–I recently made a Facebook page for The Pajama Chef. Please take a moment to check it out and like it here. Thanks! In a large bowl, combine ground beef, vinegar, Worcestershire sauce, and garlic. Add pepper to taste, then gently mix in blueberries. Shape into burgers, then cook as you normally would. On our George Foreman, this took about 8-9 minutes. Serve on buns with lettuce, tomatoes, onion, and desired condiments. Be sure to check out other great recipes from this month’s SRC round-up at the linky below. Have a happy Monday!